It’s been a very busy few months as awareness of nature connectedness keeps on growing. 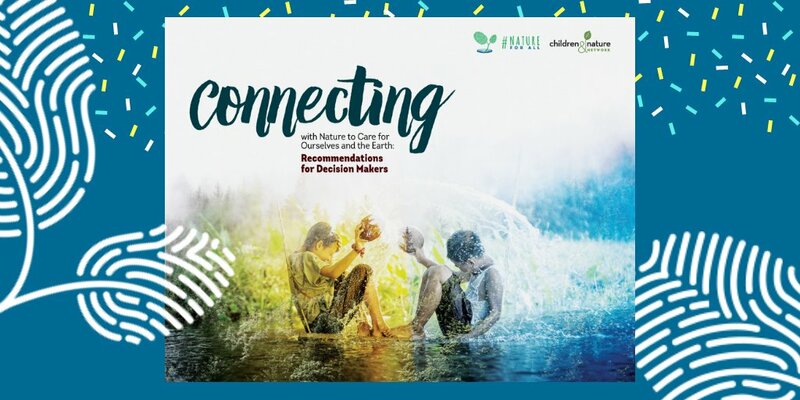 Last week the new #NatureForAll “Connecting People with Nature” publication was launched at the UN Biodiversity Conference in Egypt. The report passed through 41 reviewers from 22 countries on 6 continents and I am pleased to be a co-author. You can find the full report and recommendations for decision makers on the Nature for All website. So what else has been happening? A lot! 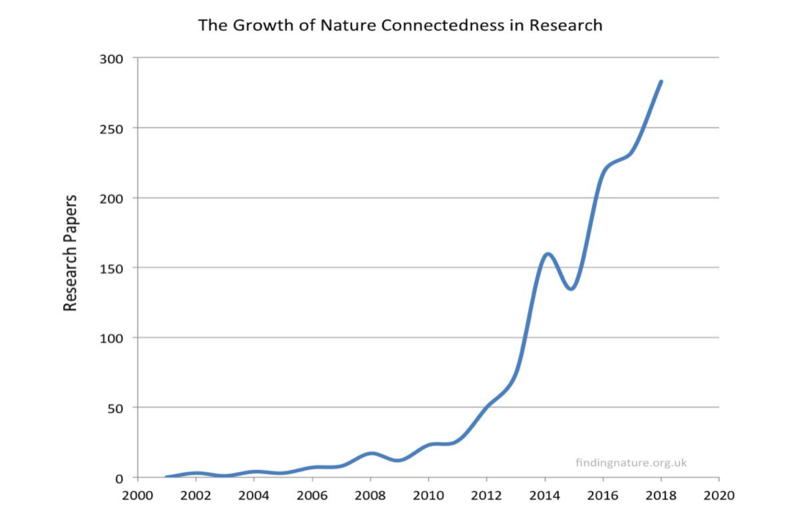 I recently counted the number of research papers mentioning ‘nature connectedness’, the chart below shows the rapid growth from zero in 2001. Of course, there’s a long history of people’s relationship with nature, but nature connectedness provides a specific construct to focus on. It has benefits for human wellbeing, nature’s wellbeing, we can measure it and change it. I’ve submitted two papers recently that will hopefully add to the chart above. One is on well-being benefits and how a smartphone based urban nature connectedness intervention brought about clinically significant improvements in mental health. The second introduces findings from a new populations measure of nature connectedness, the relationship to conservation behaviours and reveals the changes in our connection with nature over the lifespan, including undertones of teenage dips when they get their kicks elsewhere. I’ll blog about both in more detail when they are published. The benefits of nature and a close relationship to it should come as no surprise as we evolved to exist in, and make sense of, the rest of the natural world. A recent blog of mine covered evidence for this embedness and how we are interconnected within nature, a symbiotic relationship found throughout wider ecology. Another interesting paper continues this exploration showing how people are ‘walking ecosystems’ – the body as ‘a host plus billions of microbial organisms working symbiotically to form a functioning ecological unit’. In 2010 Stevens presented an ecopsychological of health that contrasted to existing models which view people as separate from the environment, affected by specific events. Given the health benefits of nature, I’ve agued that this embeddedness within the wider natural world provides a new paradigm for well-being and a need for a revised model of health. Away from the ‘biomedical’ approach based on a deviation from a individuals deviation from ‘normal’, beyond the ‘biopsychosocial’ model which included biological, psychological and social factors (Engel 1977), to an embedded model based on ‘biopsychophysis’, reflecting how health depends on the unity of biology, psychology and nature. There is a huge disparity in awareness and coverage of climate change and biodiversity loss. A quick Google news search in the summer revealed 50 million news articles on climate-change and in comparison just 1 million news articles that mention biodiversity. Yet, although inter-related there are important differences – “We are rapidly running out of time. Only by addressing both ecosystems and climate do we stand a chance of safeguarding a stable planet for humanity’s future on Earth,” Prof Johan Rockström, Potsdam Institute for Climate Impact Research in Germany. Recently, we’ve started a new PhD project (funded by the University of Derby) specifically into pro-nature conservation behaviours, in contrast to mainly environmental behaviours that broadly relate to reducing carbon footprint. Of course, we’ll be looking at the role of nature connectedness in encouraging the pro-nature cconservation behaviours required for a healthy planet, and therefore healthy people. Brilliant as Always. Will repost this report tog My contacts in Sweden. Thanksgiving for The update!